“Palm Sunday of the Lord’s Passion” is the full name for Palm Sunday, given to us by the Church. 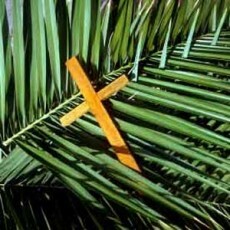 Many today call it Palm Sunday, but it is fitting to call it by the full name given us by the Church. It is the first Sunday of Holy Week, and it commemorates Jesus’ triumphant entry into Jerusalem preceding His Passion. What an event to behold, as Jesus entered, the people of Jerusalem recognized Jesus as their King, saying, “Hosanna to the Son of David. Blessed is he who comes in the name of the Lord”. Traditionally in the Catholic Church, there is the “blessing of the palms” where the palms are used in the procession. The story of Jesus’ triumphant entry into Jerusalem read as well. The hymns traditionally are focused on the theme of Christ’s office as King, and the Homily is based on the preaching of the passion. The Priest and a combination of readers generally read the Passion of Christ. Over the centuries, many customs have developed to celebrate Palm Sunday. In the Slavic countries, the faithful walked through their buildings and fields with the blessed palms, praying and singing ancient hymns. They then lay blessed palm pieces on each plot of ground, in every barn, building, and stable, as a petition is made for protection from weather and disease, and for a blessing upon the produce and property. Many continue this custom today. Here in the Unite States, many Catholics hang their blessed palms on a crucifix they have hanging, or lay it near a religious statue, often times braiding them, again, to protect their homes. The blessing of the palms is to symbolize the victory of Christ.